What did I find? Well that is a picture of me in a dress. It is not exactly me in my prom dress - I might have been using a little hyperbole when I made that statement - but it is definitely me spruced up in a gown. 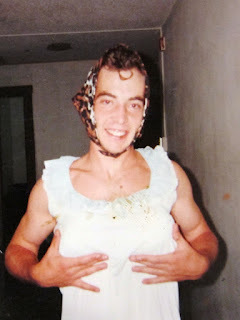 A little background on the photo: I am 21, a freshman in college, and some sorority girls dressed me up for a charity event called the "Hag Drag." I don't like to brag but I must admit I look pretty hot all pimped out like that. Sweet sassy molassey, Mr. Shife is looking good as a a hag. Evidently I was quite proud of my breasts as I was all over myself in that picture. So does that get me off the hook with all of my beloved readers? Below is a picture of my new tattoo. What do you think? There is still a little new work that needs to be done but the artist ran out of time so he will get after it next month. I would love to hear your thoughts on what you think it symbolizes. I will tell you what I was going for in the comments section. Anyway I really like it and I thought it turned out well. It really stands out compared to my old tattoo but once the color fades and the other art is added, I think they will blend well together. Have a great weekend, and thanks for stopping by. I will persevere. I will keep moving forward. I will be the stream. I was going for the balance of opposites, the yin and the yang look with my new tattoo. I think the artist really nailed it because I told him that I also did not want it to like the traditional yin and yang symbol. Have to say you looked lovely in a frock. I thought I was looking at your sister...grins. Wow, that's some tattoo. You say the colours will fade which seems a pity. Is it sore? I've often wondered how much it hurts when the tattooist gets to work. Hope your weekend goes smoothly. I was going to say balance too. It's some pretty good work, and while I'm usually not a fan of color in tattoos, I like this one. Good work. 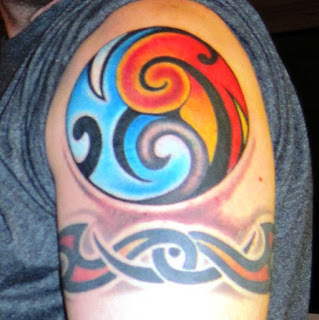 I think the tattoo is great, I probably wouldn't have guessed the yin and yang thang though. For some reason it reminds me of Hawaii and surfing, but mostly just looks cool. I like gals that are proud of their breasts but I think I would run the other way, no offense, you're a nice looking guy, just not so much as a girl. Well now I'm a little bit sorry that you found it, ha! wow, that's some tattoo. i'm guessing the after care is painful. when i got my little tattoo i thought the only pain was getting it done but putting the moisturizing lotion on and cleaning it was the painful part. when are kyle and hayden getting their names applied? I love the tattoo and I guessed right about what it means. Awesome! The dress picture is cool, good to know you follow through with things you say you'll do. I'm thinking yin and yang. Hot and cold, fire and ice. Life is always about harmony and balance. To me it looks like the four elements. Very cool art! I see how "the balance" is there too. You are the most fetching hag that I have ever seen Shife. Looking good Shife looking good haha :) I am glad you found I was starting not to believe. I have no words about your delightful photo; I am overcome with...something. Not sure what though.